If you are looking to find a way to prevent those sticky wet soap bars from mucking up your clean sink and want to avoid those cheap looking liquid soap bottles cluttering your bathroom or kitchen counter top, then finding the best liquid soap dispenser to meet your and your family’s needs can help solve these problems. Here is a look at some really great soap dispensers we have found for you. 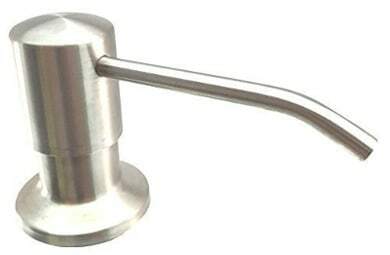 This stainless steel soap dispenser holds 17 ounces of liquid soap. It has a 3 inch rotating nozzle that reaches over the sink to catch any spills and it is easy to refill since you fill it from the top. It also comes with a 5 year replacement warranty. Is Easy and quick to install. Works well dispensing soap time after time. 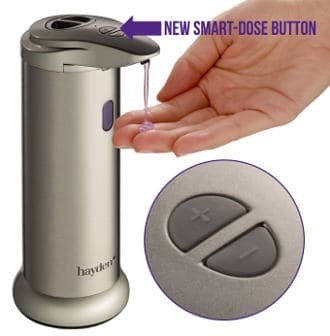 If children are so susceptible to colds and other germs that can cause illness, this Hayden stainless steel automatic soap dispenser does it part to prevent the spread of germs by dispensing soap without you having to touch the dispenser except when refilling it. It has a sleek modern design and looks great sitting on the kitchen or bathroom sink cabinet. An infrared sensor is what dispenses the soap making this dispenser touch free. The waterproof base that helps protect the battery from getting wet. 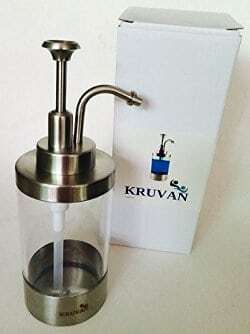 This KRUVAN soap dispenser has an elegant look as it has a stainless steel top and bottom as well as a see through clear plastic center. The clear center not only adds to this dispenser’s good looks but it also lets you see when you need to refill the dispenser without taking off the lid. Adding to this dispenser’s functionality, there is a rubber grip on the bottom to hold the dispenser on your countertop whether it is wet or dry. It also comes with a 365 day money back guarantee. It looks nice in all styles of kitchens or bathrooms. It is made of high quality stainless steel, which makes it highly stain resistant. It doesn’t drip even after countless uses. 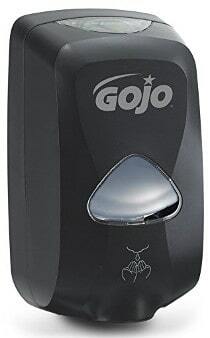 This Gojo soap dispenser uses soap cartridges and is designed especially for Gojo foam soap. It has a touch free operation and although it is highly industrial looking, it will keep the area around your sink clean and soap free. You do need to purchase 3C batteries to use with this dispenser and you can hang it on the wall either using the adhesive on the back of the dispenser or use the screw holes designed for hanging. It does not create a soapy mess. Touch free operation helps to reduce the mess and the spread of germs. The Aviva soap and shower dispenser can be placed anywhere in your bathroom including the shower. It comes in 1,2, or 3 chamber design and each chamber holds 11 ounces of soap. The pump for this product comes with a lifetime warranty. Easy to refill from the top, this dispenser attaches to the wall with a waterproof silicone 2 way tape. It is extremely nice looking. Helps declutter the shower since you don’t have multiple bottles lying around. 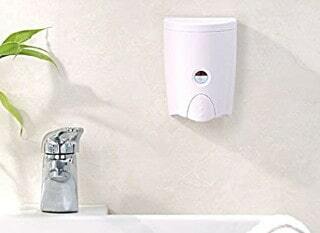 Neat and tidy looking, this small and compact wall mounted soap dispenser has a small clear window so you can keep track of when the dispenser needs to be refilled. It fills at the top and premeasures of the correct amount of soap with each pump. It also comes with a 1 year warranty. It is attractive and compact. It is easy to fill. 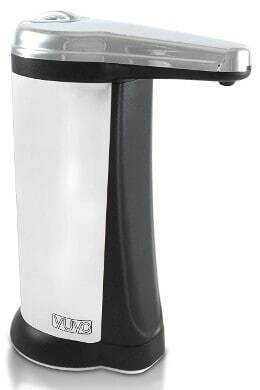 Designed for use in either your kitchen or bathroom, this YUYO dispenser works well for lotion and any type of liquid soap except for those foaming soaps. It holds 15.2 ounces of soap and uses 4 AAA batteries which do come with the dispenser. This product looks good sitting on the counter top and has two soap settings for you to choose from. It dispenses soap well and does not tend to clog. Comes with 2 soap settings so that you can get the right amount of soap you need. Great for people who are suffering with arthritis in their hands. To conclude, if you are looking for the best liquid soap dispenser, then one of the great options in this review should do the trick.